Marked ‘Module 1’, Idol of the Orcs was the first official scenario to be published by Goblinoid Games for use with its retroclone, Labyrinth Lord. As the first release, it is a low level adventure, an introductory adventure, one with a familiar set-up and a familiar Dungeons & Dragons enemy. Designed for characters of between First and Third Levels, it takes place in a region recently beset by surprisingly well organised Orc attacks upon local farms and passing travellers. The adventurers are charged with the task with striking at the Orcs in order to put an end to this menace, their having been tracked back to the Caverns of the Sacerns. The blurb on the front hints that there is something behind the Orc activities, a sinister voice giving the tribe instructions from the darkness, a demonic force which lies at the heart of the Orc lair. This is the first of several clever ideas and elements contained within the pages of Idol of the Orcs, but between them are long strands of somewhat bland game play that detract from the scenario’s cleverness. The cleverness comes in the form of just four rooms or encounters—and that across three levels of a dungeon and some forty locations. The first of these is how the Orcs are getting their new found direction. At the end of their lair is a cave with a demonic idol and it is this which has been giving them orders and advice in return for sacrifices and worship. Yet the idol is simply a statue and a hollow one at that, and there is somebody inside giving that advice in a nice nod to The Wizard of Oz. Take that one step further and then that somebody is not actually evil just desperate, which sets up a good roleplaying scene for both the Labyrinth Lord and her players. The other rooms involve a strange magical item which gives out some random effects, some beneficial, others not; a mysterious encounter with a drowning person; and an inflammatory final experience in a chapel. There are of course other rooms and encounters to be found throughout the dungeon, but these are of lesser interest and between them there is much tramping around and various fights which do not really matter. Rounding out the scenario is a pair of appendices. The first of these is Appendix A, which gives ‘Suggestions For Better Game Play’. This gives advice on handling treasure, both monetary and magical, how to be better dungeon explorers, to be prepared, and to know when to quit. It is solid advice, perhaps even familiar advice to more experienced players, but anyone coming to Labyrinth Lord—and thus Dungeons & Dragons-style play—for the first time, it is useful. The second appendix, Appendix B, provides seven pre-generated adventurers of First and Second Level, all very easy to use. There is a longstanding piece of advice that when writing a review that the reviewer does not tell the author how said reviewer would have designed the thing being reviewed. This reviewer and this review will adhere to that advice. Instead, it will make some suggestions as to how make Idol of the Orcs a more interesting adventure and a more enjoyable adventure for the Labyrinth Lord and players alike. First, lay some clues pointing towards a change in the raiding pattern of the Orcs, from disorganised sorties to well planned attacks, to suggest a change in their behavior and so add a mystery to the campaign. Ideally, these should be placed around and about the caves where the Orcs have their hideout. Second, add some clues about the caverns and their use prior to the Orcs occupying them. This should be hints and rumours rather than anything definite. Third, let the player characters encounter an Orc raiding party and learn something from it. Perhaps one of the Orcs lets slip about its new master or the Orcs seem particularly cunning… Fourth, change the profession of the clue giver from a midwife—after all, what player character in a Dungeons & Dragons-style adventure is in the habit of visiting a midwife? Five, give the players and their characters the chance to explore the rumours presented in the introduction. Sixth, add some clues in the dungeon to the secrets of the deeper levels. Seventh, add some more of the interesting rooms that are the highlight of the adventure. There are probably more things which could be done to Idol of the Orcs to make it an interesting and exciting adventure, but these are just some starting points for a Labyrinth Lord wanting a fixer-upper. 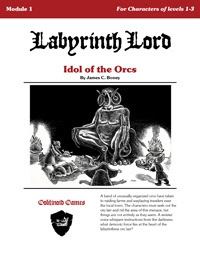 Ultimately—and as written—it is impossible to really recommend Idol of the Orcs as a first scenario for Labyrinth Lord—or any other retroclone. Its set-up is underdeveloped, its dungeons are linear and simplistic, and there really no reward for the player characters to go deal with the threat which triggers the adventure. Perhaps though, it could serve as a project for a Labyrinth Lord or Dungeon Master to develop into something more and work into a campaign setting of her own. Until then though, Idol of the Orcs is a disappointing first ‘Official’ scenario for a retroclone as solid as Labyrinth Lord.